The original Moscow mule is a great canvas for some tasty variations. The Garden mule is my most recent concoction and my best Moscow mule recipe yet. It is fresh, fun, and just the thing for summer. I love it's gorgeous purple color. This recipe was featured on Huffington Post and selected as a Community Pick for Food52's Best Day Time Drink contest. Regular Moscow mules do not require any muddling. Garden mules definitely need muddling. That is what makes them so good - muddling up the blueberries, cucumber and mint so they are infused into the cocktail. You will need a cocktail shaker, a muddler and a strainer. 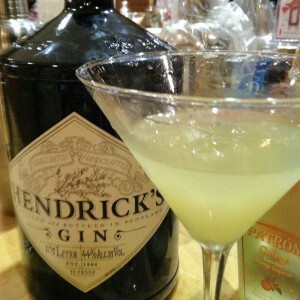 See my post on Cocktail methods for the novice mixologist to learn what you need to get started. We like Fever Tree and Maine Root. Don't substitute ginger ale. It is not the same. Here are my favorite Moscow mule mugs, the same ones that are pictured above. These are also very nice, and significantly less expensive. And here are my best tips for cleaning your Moscow mule mugs. The Garden mule is my best Moscow mule recipe and has been featured in Huffington Post and Food52. Blueberries, cucumber and mint are muddled, creating a garden-fresh cocktail, perfect for a hot summer day. Put the cucumber, 8 blueberries and mint leaves in the bottom of a cocktail shaker. Muddle until crushed and juicy. Add a handful of ice, vodka and lime. Cover shaker and shake for about 15 seconds, until the shaker develops a nice coat of condensation on the outside. Fill a Moscow mule mug with ice. Strain the liquid from the shaker into the mug. Top with ginger beer and 4 blueberries. Thread 4 more blueberries and a piece of candied ginger onto a toothpick. 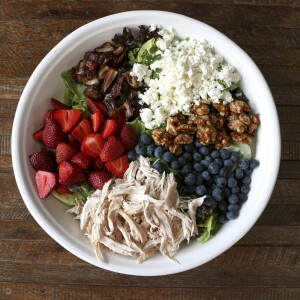 Garnish with a sprig of mint and the toothpick of berries and ginger. I’m glad you enjoy our Garden Mule Taylor. Yes, I agree, it is always a little dangerous when Eric bartends! Refreshing and delicious. They looked very appetizing in the Moscow mule mugs I bought, which are a great idea. Everyone loved them. As I am sitting here in the heat of August I am thinking a chilly Garden Mule would go down very nicely right now! Hi Sara, This is my #1 favorite Moscow mule. Next is my new Pomegranate Mule. The bottom line is there is a lot of room for innovation when it comes to Moscow Mules. The basic vodka, lime, ginger beer combination lends itself to all kinds of creativity. 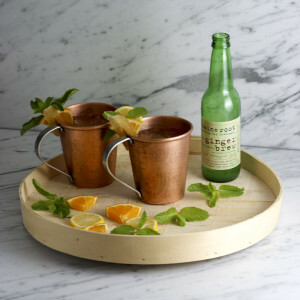 Pingback: Moscow Mules | Page Hardware and Appliance Co.